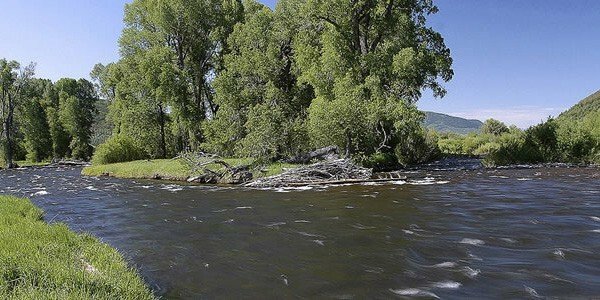 "A spring creek near Gunnison, Colorado was experiencing serious erosion issues and was in need of restoration for suitable fish habitats. The current ranch owner recognized that the most valuable asset on the property was the extensive water rights and decided to develop them in a sustainable, responsible way...."
"Human and agricultural practices have led to the degradation of many of the nation's fisheries, and Skelton is committed to reversing this trend. With preservation in mind and a proven technique, Sweetwater is returning these precious resources into thriving fisheries...."
"Beyond aesthetics, Skelton thought that conventional methods of building and improving streams often solved hydrology issures at the expense of biology...."
" After Sweetwater finishes restoring damaged streams, fish tend to return to the waters. 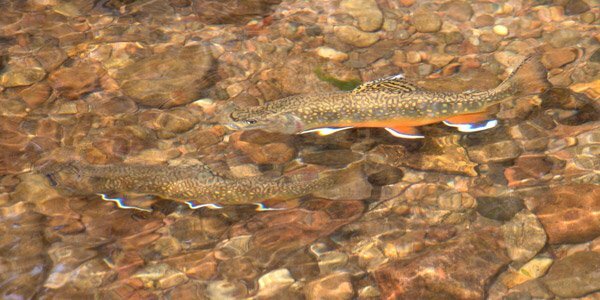 Trout move in search of quality habitat, and when they find a section that Sweetwater has built, they tend to stay. “For me, the world’s perfect when that happens,” Skelton said. ...."
"Ranchers and farmers have long viewed their on-property water sources as irrigation for crops, rations for their livestock, and private playgrounds, often running fly fishermen off their property. 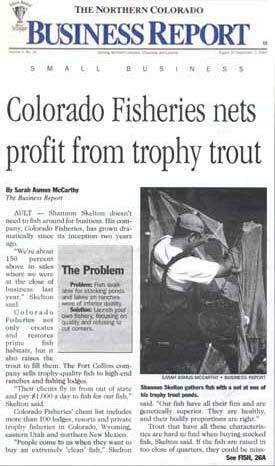 What many don’t recognize is the economic potential of having a fishery as part of their landscape...."
"The lack of quality hunting or fishing opportunities is a leading factor in why die-hard sportsmen take matters into their own hands. 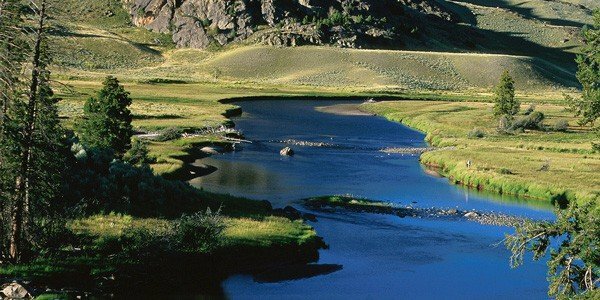 Whether purchasing a 25-acre farm or a 250,000-acre ranch, the ultimate goal is to capture their own little slice of heaven...."
"A POOL FOR EVERY RIFFLE. BIG ROCKS AND SMALL ONES. CURVES, BUGS AND EVEN FISH YOU MAY NOT LIKE. FIND ALL 10 OF THESE FEATURES AND YOU BETTER START CASTING...."
"One of the more interesting trends developing in the world of ranch ownership is the relationship between agricultural land use and recreational sporting opportunities. There was a time in the not-too-distant past when agricultural practices and outdoor activities, flyfishing in particular, were at odds. Ranches with fishing opportunities were viewed strictly as a sportsmans’ ranches, while a ranch with good operating features was pigeonholed as a working ranch......."
" Five years ago, the creek was a turbid, shallow mess. Hay operations reached to the water. Decades of cattle grazing had eroded banks that washed away with each year’s runoff. The tepid trickle hosted sickly, non-native fish that rarely reached maturity." 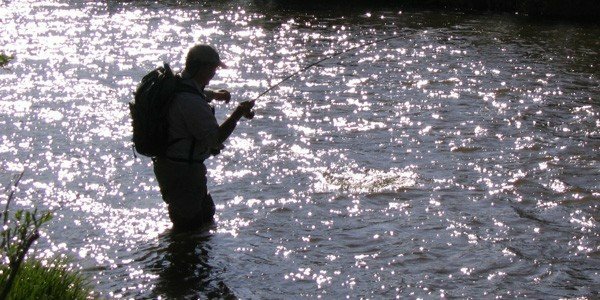 "Our clients are mostly ranch owners across North America that have mediocre or degraded rivers and streams on their property that they want to be very high-quality fisheries. They hire us to come discover, evaluate and enhance these amenities, and develop land practice, irrigation and livestock grazing strategies that will maximize efficiency while ensuring these fisheries sustain very productive and thriving ecosystems........"
"Fish are central not only to the Skeltons' travel destinations but also their livelihood. 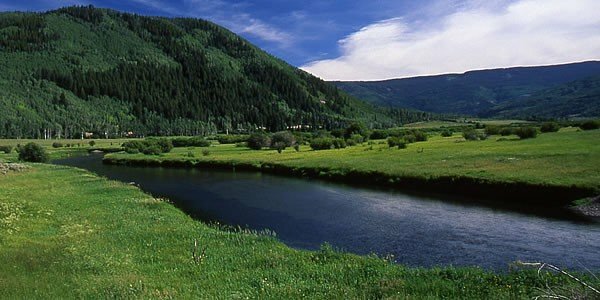 The Fort Collins couple’s company, Sweetwater Fisheries Group, specializes in creating, rehabilitating, enhancing and managing streams, rivers, lakes and ponds so that fish can thrive......."
"SFG is on the forefront of Ranch Enhancement and Preservation in America. 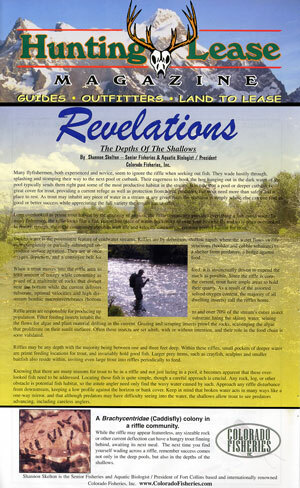 Their industry leading techniques and science-based approach to fisheries stewardship have made them the firm of choice amongst ranch managers, landowners, and developers nationwide......"
"In a specialized industry that is catering to a certain clientele there is still an opportunity to stand out, in principle and in project success. 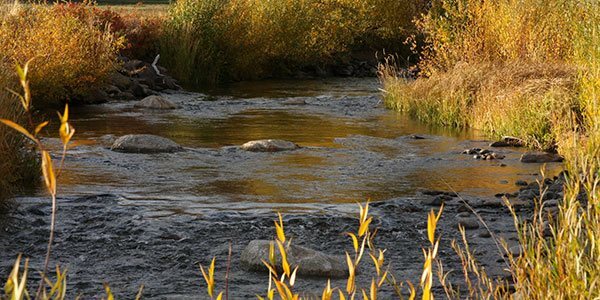 Sweetwater Fisheries Group, a Fort Collins, Colorado based company, is carving a niche into a path less traveled......."
"Long overlooked as prime trout habitat by the majority of fisherman, the riffle community holds everything a fish could want. 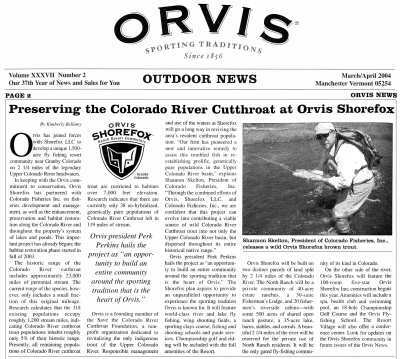 To many fishermen, the riffle looks like a flat, featureless piece of water, beckoning to snag your favorite fly and so is often ignored......"
"In keeping with the Orvis commitment to conservation, Orvis Shorefox has partnered with SFG on fisheries development and management, as well as the enhancement, preservation and habitat restoration along the Colorado River and throughout the property's system of lakes and ponds......"
"SFG not only creates and restores prime fish habitats, but it also raises the trout to fill them. 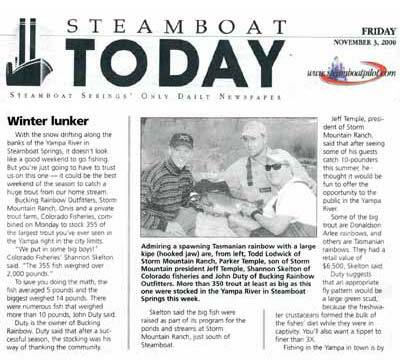 The Fort Collins company sells trophy-quality fish to high-end ranches and fishing lodges......"
"SFG is one of the largest distributing manufacturers of custom lake aeration. They have more than 40 solar, wind and electrical systems to add oxygen evenly to lakes or ponds." 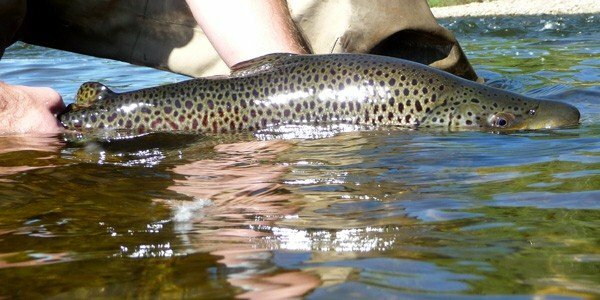 "Our focus is creating and maintaining quality fisheries and stream restoration projects as well as maintaining our quality fish and keeping our production numbers up," Skelton said......"
"Bucking Rainbow Outfitters, Storm Mountain Ranch, Orvis and a fisheries consulting firm, SFG, combined on Monday to stock 355 of the largest trout you've ever seen in the Yampa right in the city limits......"